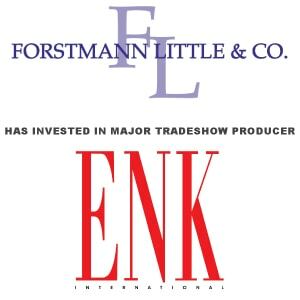 Forstmann Little to invest in ENK International - Berkery, Noyes & Co., LLC. NEW YORK, April 26, 2006 — ENK International, the Fashion Industry’s most exclusive tradeshow organization, and Forstmann Little & Co., a New York private investment firm, today announced that Forstmann Little will make a substantial investment in ENK to provide capital to further accelerate ENK’s impressive growth. Elyse Kroll, founder and CEO of ENK International, will continue to be a major shareholder of the company and drive this expansion as its CEO. ENK, founded in 1981 by Ms. Kroll, provides the forum for the fashion world to conduct business. ENK leads the upscale fashion tradeshow industry, providing marketplaces for over 9,000 designers in men’s, women’s, accessories, footwear, denim and children’s categories to critical fashion retailers, representing both specialty and department stores and editors from around the world. In 2005, ENK conducted 22 events, 16 of which were held in New York City, five in Los Angeles, and a debut show in Las Vegas. Forstmann Little already has a significant presence in the Fashion Industry through its ownership of IMG Worldwide, the world’s premier sports, entertainment and media company. IMG owns and produces Olympus Fashion Week in New York, as well as well as numerous other fashion events globally. The transaction, which is expected to close in May, is subject to regulatory approval. It is not subject to financing. Berkery, Noyes & Company, LLC acted as the Company’s exclusive financial advisor in the transaction. Gibson, Dunn & Crutcher, LLP and Gold & Gold, P.C. acted as Counsel for ENK. Kirkland & Ellis LLP acted as counsel for Forstmann Little. ENK International provides the forum for the fashion world to conduct business. It is the leading tradeshow organization serving the upscale fashion marketplace, including the men’s, women’s, accessories, footwear, and children’s categories. Founded in 1981 by Elyse N. Kroll, the Company conducts 22 events per year, 16 of which are held in New York City, five in Los Angeles and its 2005 debut show in Las Vegas. ENK events are attended by critical fashion retailers, representing both specialty and department stores from around the world. They represent over 9,000 domestic and international exhibiting companies, and over one million net square feet of exhibit space. The Company’s FASHION COTERIE brand is the unrivaled marketplace for women’s high-end designer, contemporary, denim and lifestyle fashion in the United States and is a “must attend” exhibition for high-end buyers and sellers of women’s fashion. SOLE COMMERCE was launched in response to market demand and since its inception in 2001, SOLE COMMERCE has doubled in size. INTERMEZZO Collections debuted in 1988, creating the mid-season buying and selling marketplace for women’s wear. Taking place in January, May and August, these shows provide the industry with the opportunity to buy products mid-season and for immediate purchase. The ACCESSORIE CIRUIT brand was launched in 1987 and is the most important women’s accessory exhibition in the country and takes place three times each year. The COLLECTIVE, as with all ENK brands, represents only the highest end of the men’s fashion world. In 2000, the Company launched its children’s exhibition under the brand CHILDREN’S CLUB in response to market demand and customer persuasion. BRIGHTE COMPANIES are the Company’s West Coast events in LA and Las Vegas. In 2006, ENK International launched its first premium denim exhibition called BLUE, and an intimate showcase for very exclusive international accessories called CLEAR. Since 1978, Forstmann Little has made 30 acquisitions and significant equity investments, returning billions of dollars to its investors. The firm’s best-known investments include Gulfstream Aerospace, General Instrument and Ziff-Davis Publishing. The firm currently holds substantial ownership interests in Citadel Broadcasting (NYSE:CDL), a leading radio broadcaster in mid-sized markets, 24 Hour Fitness, the world’s largest fitness center company, and IMG Worldwide, the world’s premier sports, entertainment and media company and the owner and producer of New York’s Olympus Fashion Week. Buyer: Forstmann Little & Co.